Hong Kong is one of the most vibrant cities I’ve ever visited. A couple of years ago, we took an Asian cruise beginning in Singapore and culminating with a 3-day stay in Hong Kong. The bustling metropolis combines East and West in a fascinating way. A shopper’s paradise, this city offers fantastic deals on everything from electronics to jewelry to custom made clothes. The topography of this visually stunning city on the water takes your breath away. Of course food in Hong Kong had my full attention. We started the first day with a delightful dim sum lunch, but the culinary high point was the evening we spent at an outdoor market. Dinner consisted of giant prawns (and I mean giant) fresh out of the water, stir fried garlic choy sum, and chicken fried rice, all served on paper plates with an ice-cold Tsingtao. Fantastic street food, bright lights, chaotic crowds, and people-watching made for a truly unique and exciting evening. For today’s post, I made a Hong Kong-Style Sea Bass over stir-fried spinach. This dish, a creation of the Atlanta Fish Market, is featured in the cookbook, Signature Tastes of Atlanta. Steven Siler, a firefighter-turned-chef and an Atlanta native, created a series of Signature Tastes cookbooks from across the country. These cookbooks feature the best restaurant recipes from each city. To quote the blurb on the back of the book, “Signature Tastes of Atlanta captures the culinary essence of the city known as Hotlanta”. You can order a copy here for $9.95. Proceeds for the book benefit Meals on Wheels. The Atlanta Fish Market is one of the city’s premier seafood restaurants located in the Buckhead section of town. Atlanta is landlocked and seafood in the city isn’t always as fresh as a what you would find in a coastal city. The Atlanta Fish Market overcomes this limitation by flying in fresh seafood daily. It’s one of my favorite restaurants in Atlanta and I highly recommend stopping by if you’re in town. 1. Combine soy sauce, water, sherry, and sugar in a small sauce pan. Bring to boil, reduce heat, and cover to keep warm. 2. Place sea bass on a steaming rack. Top with julienned ginger. Place over simmering water, cover, and steam for 6 to 10 minutes. Cooking time will depend on thickness of filets. When flesh is opaque and starting to separate, remove from heat. 3. While fish is steaming, heat sesame and olive oils in a large skillet. Transfer spinach to skillet and cook, tossing regularly with tongs. When leaves are wilted, remove from heat. 4. 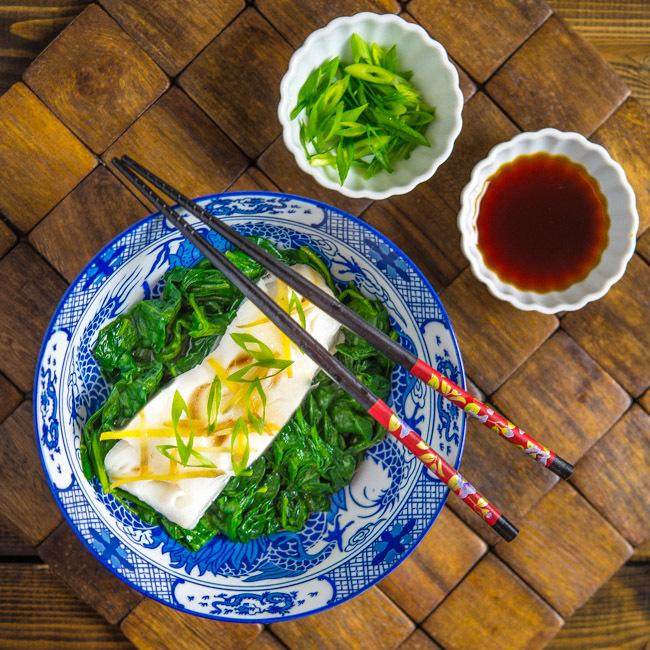 To assemble, divide spinach between four plates, top with fish filets, garnish with scallions. Spoon sauce over spinach and fish and serve with additional sauce. Hi Bill I love your blog greetings from Spain. Thank you so much, Claudia. I really appreciate your comment!